The Outer Hebrides is a chain of more than 100 islands off the northwest coast of Scotland. Cancer nurses working on the islands must often travel by ferry or plane to reach their patients. The Outer Hebrides lies off the northwestern coast of Scotland, a chain of more than 100 islands that curves its way through the Atlantic for over 200 kilometres. Roughly 26 000 people call the islands home, though only a small number of the islands (15) are inhabited. Some residents are “incomers” – people who have moved to these remote and beautiful islands – while others are locals whose families may have lived there for generations. Whether an incomer or longtime local, everyone living on the islands faces the same reality: travel to any of Scotland’s major cities, and hubs of medical care, requires either a plane or ferry ride. But thanks to Hazel, her fellow nurses and other colleagues, cancer patients in this distant corner of the United Kingdom can receive quality health services close to home. Fiona grew up on South Uist, in a village with a grand total of 15 houses. She worked for several years in Glasgow, but eventually felt the pull to return home. She moved back in 2007, and soon after became part of the 7-person team of nurses that provides care for cancer patients across the islands. Although the nurse posts in the Outer Hebrides were originally funded by the charity Macmillan Cancer Support, today they are fully employed by the Western Isles Health Board. However, they are still known as “Macmillan nurses”. 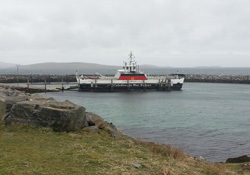 The Outer Hebrides sees approximately 200 new cancer diagnoses per year. With these newly diagnosed patients, existing cancer patients on continuing treatments, and patients requiring palliative and end-of-life care, the caseload of the 7 nurses can be quite heavy. Every day is different for the Macmillan nurses. Sometimes they spend the day checking in with patients at one of the small health clinics or hospitals scattered across the islands. They support patients on chemotherapy and biological therapies. They assess and prescribe for patients who require complex symptom control. They liaise with specialists in Inverness or Glasgow by phone or video link to discuss treatment options for their patients, or they meet with visiting physicians. Other times their day starts with an early morning plane or ferry ride to a neighbouring island, where they drive along winding one-track roads with breathtaking coastal views – and the occasional traffic jam of sheep, red deer or ponies – to visit patients in rural villages. Their tasks are wide-ranging: they check in with patients to see how they are managing their symptoms; they monitor people taking therapies; they care for wounds following surgeries; they convey test results; they identify serious medical situations and coordinate the best way to respond. But, in addition to all of the highly skilled medical care they provide, the nurses also talk with their patients and families, taking time to get to know them, to understand their needs, concerns and wishes, and to anticipate their future care needs. Hazel originally started learning about lymphoedema, a condition of fluid retention and tissue swelling, because she saw there was a gap in related skills on the Western Isles. It is now one of her specialty areas, along with breast cancer. Likewise, when she realized that there was no hairdresser on the islands who knew how to fit wigs for cancer patients who had lost their hair, she decided to learn how to do it herself. Her colleagues have found their own niches and specialty areas, such as treating children with cancer, where they have worked to bring an extra level of specialized care to their patients. It can be difficult for the nurses to fit this continuous learning and development into the clamour of their daily responsibilities, but the effort is worth it because of the difference it makes in their patients’ lives. At the policy level, WHO and Member States often emphasize the importance of people-centred care and moving towards universal health coverage, including access to health services for all. In the Outer Hebrides, these are not just lofty ambitions – this is precisely what the Macmillan nurses deliver on a daily basis. The nurses bring high-quality health services directly to their patients, even in rural villages on the northwestern edge of Scotland. Their style of care follows from the patients’ needs, first and foremost, and emphasizes the importance of working in collaboration both with patients and with colleagues and peers. The value of their work has not gone unnoticed – they won the Cancer Team of the Year award for the entire United Kingdom in 2016. But the appreciation of patients is what these nurses value most.